So yesterday sucked. Big time. It was not one of my better days at work, Barbaro, the race horse, died, and then I came home feeling crappy and made the mistake of watching the news. I am very attached to race horses, and also to the New Bolton Center of the University of Pennsylvania School of Veterinary Medicine. There is no place in the universe where Barbaro could have received better care, or been with people (besides his owners of course) who really truly cared about how he was doing. Another topic altogether, though. Today, I was thinking about my relationship with thoroughbreds, and I thought of an amusing story to share. Since I don't currently have any knitting to show you, and am still at the very very beginning of a couple of projects, I thought I'd post about Days at the Races with My Parents. As you may have determined from previous posts, my family did not have a lot in common with Ozzie and Harriet, or the Brady Bunch, or just about any other "ideal" American family. My parents were two individuals who were extroverts with a lot of friends, but also didn't care if everyone they met liked them, or approved of them. (How many times growing up did I hear the toast: "Here's to those who love me well, all the rest can go to hell"? Enough times that I thought it was a regular (i.e., acceptable) toast ...) This is a trait I admired in both of them, but was also sometimes problematic. One of my parents' favorite pastimes was going to the races, particularly the horse races. And most of the time, the whole family went. We would get to the race track, and my parents would get the racing form, decide their bets, buy their tickets, etc., while my sisters and I would have a soda, or potato chips, or just enjoy seeing the various people who were also there at the racetrack. ** Of course, once any race where either of my parents had placed a bet began, we would all cheer for the horse. (We especially liked it when my father would win, as he would share the winnings with us.) This was a pretty regular weekend event for us. One Monday morning, when I was probably in second or third grade, Sister Mary Snoop was going around the class, asking everyone how they had spent time together as a family over the weekend. There were the usual trips to the movies, or dinner at grandma's, time spent at church, etc. Then she got to me, and I said that we had gone to _______ Park and spent the day at the races. Sister then said, "Oh, I don't think so, surely your parents wouldn't want you to be around gambling??" (Which was ironic, because it's likely that before I even left the house for school that morning, my mother had bet me (literally) that I couldn't guess what she had packed for my lunch.) Anyway, I continued to insist that yes, I had too been at the races, and I think I even mentioned a couple of the horses that won, and what they paid. At which point, Sister just moved on to the next child, probably praying that they had spent their weekend in the house reading the Bible aloud to one another - kinda like the Flanders on "The Simpsons." The rest of the day went as usual, and I gave no more thought to Show Me The Money, or his handicap in Race 7. When I got home from school, I did my homework as usual, and shortly afterwards my mother got home from work, and said that Sister had called her. Which was never a good thing. At least in our house, as teachers were never calling my parents to say that we were amazing children or an inspiration to our classmates (except for my sister Mary Ellen on occasion). Apparently Sister had called my mother, and said that I was telling stories in school that couldn't possibly be true. When my mother asked for an example, the nun told her of my description of our weekend activities. To which my mother replied, "Oh, she wasn't making that up. We were at the races all day." I have no idea what else was said by either party. But Sister never asked again what anyone in the class had done with their families over the weekend. 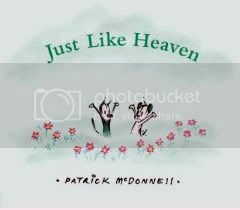 **I don't remember ever thinking the other people at the track were all that different looking from people I saw anyplace else. I only found that out when I saw them portrayed in movies! 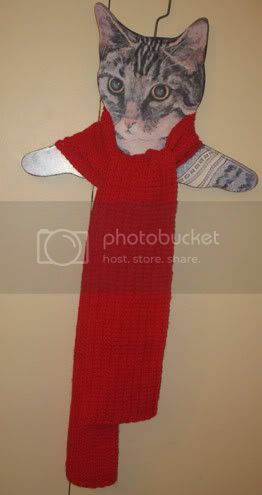 The pattern used here is the One Row Scarf pattern posted by the Yarn Harlot a while ago. It's a great pattern, because it's interesting enough to require some degree of attention, but not so involved that you can't do anything else. The fabric it creates is a nice, cushy type of knit, and I have decided I may have to make a scarf for me using the pattern, I like it so much. Hopefully whoever receives the scarf will enjoy it. I have decided that besides just trying to knit from my stash, I'm going to try and finish some of the many projects that are sitting around looking sad and lonely and unfinished. So this afternoon, I picked up a hat I'd started a few months back, and had set aside. I was very proud of myself, because I finished the bottom ribbing, and was starting the actual body pattern. Until I lost count and had to rip back. I have decided, however, that I am not going to let this hat claim victory. I will, however, wait until another evening to attempt another try at the pattern, because I just think I'm tempting fate to pick it back up tonight. Then I want to start a pair of socks for myself, since a) I hardly have any handknit socks (most of the ones I've made have been gifts), and b) once I get started, I can usually handle plain socks without too many, ahem, problems ... that way, I will have the hat to work on when I can concentrate more, and the socks to knit when I want to knit and watch TV or a movie. I would like to say that maybe I'd have one or both projects done by the end of February, but I really don't want to feel like I have a deadline, since I don't! I enjoyed making the scarf, but the last few things I've knit have had deadlines, so it will be nice to knit without one for a change! I had completed all but the sleeves during the workshop last Saturday. So that I wouldn't put it aside to finish it "soon," and then find it sometime in 2010, I decided that I would be sure to finish it by adding the sleeves sometime during this past week. That was accomplished in an evening, and so here is the completed mini-gansey. It's a little bit hard to tell from the photo, but you can get the idea of the diamond shapes and baby cables going up the front (and the back for that matter). For whatever reason, the gussets fascinate me. It's not like it was the most difficult part, I guess it's just because I like the way it looks once it's complete. So voila - my first completed project of 2007! Who'da thunk it?
" Thank God it is too small for me!" The other day, I left a post on another person's blog, about something that happened to me as a kid. I thought it was kinda funny, but she sent me an e-mail that made me realize how weird/funny/shocking it could be, depending on your viewpoint. Since I have been spending this week recovering from something that I thought I had "cured" all by myself last week, I thought it would make for an amusing post. My father's remedy for an upset stomach was to eat a pat of butter. Which as far as I was concerned, took care of the upset stomach, since eating a pat of butter was enough to make me throw up everything I'd eaten since I'd been born. For cold sores in your mouth, you should take a Q-tip and dab them with vinegar for two days. I can guarantee that this will really WAKE YOU UP first thing in the morning. But oddly enough, it does seem to work. To keep you from coughing all night, keep a glass of wine (preferably red) next to your bed. When you wake up coughing, sip the wine. It knocks you out enough to go back to sleep. For chest or head congestion, the remedy is Hot Tea. No, not hot tea, but Hot Tea. This consisted of half hot tea with half whiskey, and a touch of lemon if you were doing well enough to be able to afford lemons at the time. Another one of my father's tricks, when he would get a splinter, would be to wrap a strip of bacon around it. The grease from the bacon would eventually make the splinter slide out. (My sisters and I were more willing to take our chances with the sterilized needle theory of my mother. The dog, however, thought my father's solution was an excellent idea.) My mother was always highly annoyed by my father using bacon to treat a splinter, since "there's not a damn thing you can do with a used piece of bacon" (the dog disagreed). Like most kids, I never thought twice about these things, until the time I went to a friend's house for a sleepover. I think it was probably about second grade. I had been getting over a cold, and still had a cough. When we were going to bed, the friend's mother asked if I had brought cough syrup with me, to which I replied that all I needed was a glass of wine next to my bed! Well, the friend's mother called my mother, and who knows what transpired between them. But when I got home the next day, my mother said the next time, she would send me with cough syrup, and that I should remember that "not everyone believes in wine"! On a related note, I didn't get asked to any more sleepovers. Go figure. 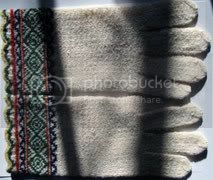 From the time I learned to knit, I have wanted to learn the techniques to knit a gansey, as I love the look of them. So when the opportunity to learn from a true expert presented itself - and at a location literally around the corner from my house - you can bet I signed up! There were about ten of us in the class, including Craig, the owner of the store. Beth had brought a lot of samples of ganseys that had appeared in the book, so we could see them in person, as well as a bunch of patterns and samples of her other work. I always thought, looking at the book, that her designs were pretty cool, but seeing them in person - and in living color! - was another thing altogether. 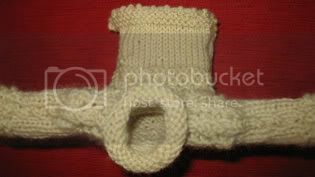 The goal of the class was, obviously, to learn to knit a gansey, by learning the various techniques that were necessary to be successful. Beth gave us a bit of history of the gansey, as well as explaining the origins of some of the classic patterns, and also showing us examples of more modern patterns that could be incorporated. Then we got started. Like any new thing, at first it was somewhat overwhelming, and as usual, I was the slowest one (not necessarily as far as understanding what to do, but in the knitting necessary to get there). Beth said at the beginning of the day, that by the end, if we had the body and neck of our mini-ganseys done, and were ready to add the sleeves, she would consider the class a success. During the course of the day, there were times when I thought that if I could just get to the top part of the sweater, I would consider the class a success ... but as the day went on, I realized that I had actually benefited from being the slowest. Because I had the chance to hear her explain and re-explain things to several people in the class. This turned out to be a good thing, since there were things that I knew to be on the lookout for, or to avoid doing so as not to have to start over, etc. And guess what? By the end of the day, I had the body and the neck of my mini-gansey finished! Not only that, but I had learned two new cast-ons (Channel island and provisional - provisional being one that had been shown to me quite a number of times, and never ever registered before - I get it now! ), how to make welts, gussets, include knitted-in initial, and a good overview of how to go about designing your own gansey. Beth gave us great handouts, and the pattern was both written out ("in excruciating detail" according to her), and charted. It was a great chance to get used to knitting from a chart for someone like me. Since the charts we were using were so small - meaning so few stitches to any given round/row - I got more comfortable with how to read a chart. Most importantly, Beth Brown-Reinsel turned out to be one of the nicest and most personable people I have ever met. You couldn't ask for someone better to teach something that requires so much of your attention. She was great at explaining things, and showing you how to do it, or where you made any mistakes, and how to fix them. She went around the table asking each person to talk about how they learned to knit, and when. She had a great sense of humor, and one of the prettiest smiles I've ever seen on anyone! 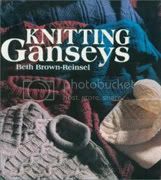 If you are interested in ganseys, and ever have a chance to take a class from her, sign yourself up! You won't regret it for a second. Trust me, there are not that many things that would make me give up an entire Saturday, and this was more than worth it. Lisa talks about there being such an abundance of books being published that promise to provide the knitter with easy or simple or anyone-can-do-it type of patterns. She goes on to question how beneficial it is to teach someone to knit, and never challenge them to go beyond garter stitch scarves, for example. She points out that it is true that once you know how to knit and how to purl, you have learned the basics, and a lot of the rest is both practice, and learning some new techniques. This helps you not only advance your skills, but allows you to broaden your knitting horizons considerably. 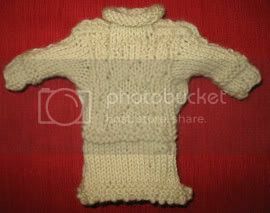 So I started thinking about my very own knitting, and whether or not it has progressed that much at all. When I learned to knit, Lisa was the person who taught me. 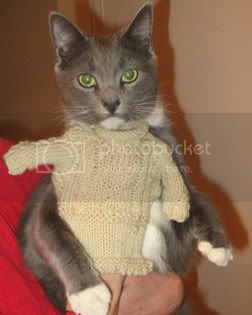 I took a group class, and everyone was going to knit a sweater. I remember saying, "What kind of pattern should I pick," and Lisa saying, "Whatever one you like." So I chose one with cables, since I love cables. 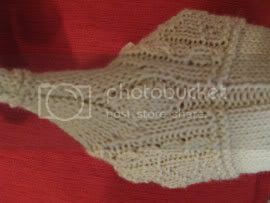 It took me a while to finish it, as Slow Knitter + Sweater Pattern = Long Term Project, but when I was finished, I not only knew the basic stitches, but how to knit cables. 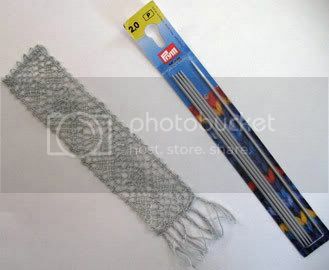 It was only later, when I would talk to other knitters, that I would find out that for a lot of them, cables were in the gee-I'd-love-to-but-I-know-they're-too-hard-to-learn category. But there I was, with my cabled sweater. When they offered a class to learn to knit hats, I signed up. Likewise with socks. At no point did I consider myself an expert, but I would see yarn, or store samples, or other things that people were making, and would think, if they could do it, I could do it. So I'd wait for the opportunity to learn. I'm one of those people who needs to see something demonstrated, then I can follow it in a book. But most of the time, reading the directions and looking at illustrations don't do it for me, when it's a new technique. Have I made incredibly simple things, even though I know how to do some of these other things? Duh, yes. But I've also tried, with different levels of success, to go a step further, and at least try something. Like any other endeavor, I like some things better than others, but I like to feel like I at least gave it a shot. So in thinking about Lisa's comments today, I realized that at least for me, knitting is like reading. I love to read. Sometimes novels, sometimes mysteries, really just about anything - it depends on both my mood and what else is going on around me. For instance, during our holiday break, I was in the mood to start something new, but not anything too involved. I was tired, and wanted to read something that wouldn't be incredibly serious or detailed, or even true-to-life. So I picked up a mystery that I had in a stack of books, and it was just perfect. I really enjoyed it, and it was just the right combination of what I wanted at that time. In the last couple of weeks, I've been reading The Woman in White, which is the January selection of Knit the Classics. So far, I'm completely involved in the story, even though it is a lot more complex, as far as language, number and type of characters, and themes, than the mystery I read only a few weeks ago. Right now, I'm working to finish a scarf I'm knitting for the Red Scarf Project. It's a simple pattern, so that a) I can finish it in time to send it before the deadline, and b) so I can knit while watching TV, talking to people at lunchtime at work, etc. It's just right for what I need right now. What will my next project be? At this point, I'm not really sure. I have a few things that I really should finish, so I might work on finishing something, while also starting a new project. I have learned that I like having two projects going, one that is basic, or simple, or whatever you want to call it, and one that is more challenging. 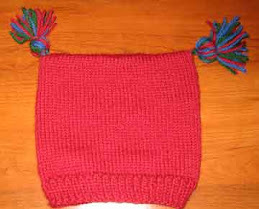 Knitting, like reading, appeals to people for a number of reasons. I am glad when I hear that more people are knitting - or reading - and to some degree, I believe that doing either one is a good thing at any level. But if everyone only ever makes plain garter stitch scarves, or only ever reads the quickie celebrity bio of the week, it gets pretty boring, pretty quickly. You know what you should try? Cables! Well, he isn't having a bar mitzvah, but today is Sebastian's 13th birthday. Seb is Tim's Little Brother, through the Big Brothers/Big Sisters organization. We first met Seb about three years ago, when he was about 10 years old. Here's what he looked like then. 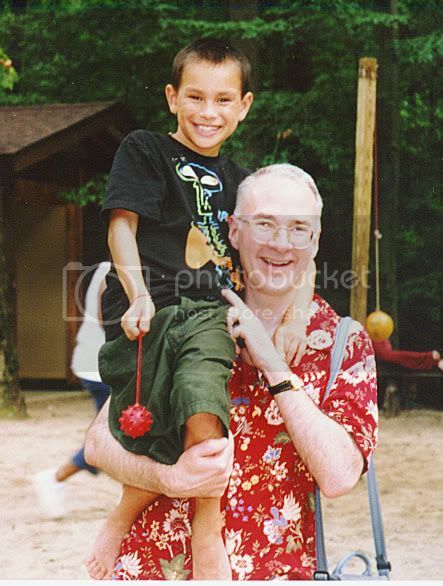 Tim and Seb at Camp Dark Water Visiting Day, 2004. As you can see in this photo, he was quite possibly one of the cutest kids on the planet! And from the beginning, he was such a character, and so much fun. He and Tim took to each other right away, and it was literally a match made in heaven. 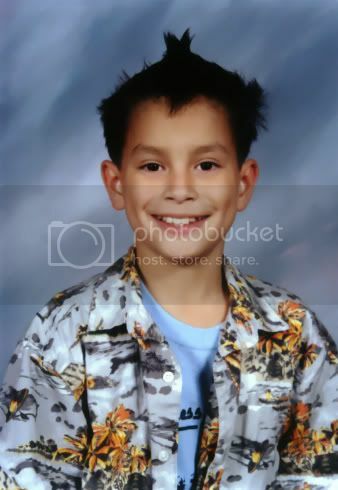 Then there was Seb's 4th grade school picture, where he thought it would be cool to have his hair styled in a mohawk. But it only goes to show you how great a sense of humor he has, and how much fun he can be. From the beginning, he has become one of our very favorite people, and a part of the family. That even goes for the extended family, as he and his mom have been included in family events like one niece's baby shower, and another niece's wedding. It is not hard at all to love Sebastian. He is, as I have mentioned, a lot of fun, and has a great sense of humor. He is incredibly smart, and can carry on a conversation with an adult without blinking an eye. He is definitely one of the most well-mannered, considerate, and kind persons I have ever met, which is a testament not only to him, but to his mother who has raised him to be the kind of person we should all be so lucky to have in our lives. Among his other qualities, he is also artistic. This is logical, since his mom, Karen, teaches fashion design here in Philadelphia, and his father, Fernando, is a well-known artist in Oaxaca, Mexico, which also happens to be where Seb was born (which makes him more of a world traveler than me, from the get go!). 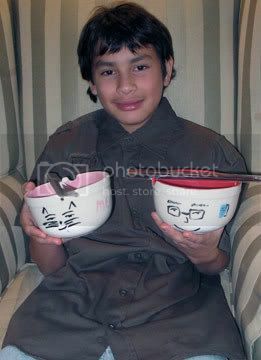 This Christmas, he made each of us rice bowls (we eat a lot of stir fry), with illustrations that were indicative of our interests. Here he is today, modeling his artwork. The bowl on the left is mine, and has not just a cat face, but a dog face; Tim's bowl, on the right, has a "portrait" of Tim, but also illustrations for books and music, two of his favorite things. You can also see from this picture that Seb looks like a teenager - oh no, he's growing up! To celebrate his birthday, we all went bowling. Seb and I turned out to be the King and the Queen of The Gutterball, at least until we got warmed up. It was a lot of fun, and we were glad to be included in his birthday celebration. So, even though he may outgrow us, we will always think of him as our very own boy. For better or worse, he is now stuck with us, as well as with our extended family. So anyway, I decided that since it was a "free" day, I'd work on some things that I would otherwise only be able to do in the evenings or on a weekend, thereby freeing up that time. I had what I thought was a list based on realistic expectations. The morning would be spent going to the gym, doing some laundry, baking a coffee cake, and putting some Christmas stuff away. This worked pretty well, and by lunchtime I was just anxious to get out of the house for a while, so I walked up to Barnes & Noble to say hi to Tim, and he was nice enough to buy me a coffee at the cafe. I figured that coffee would keep me going, since my afternoon's plan was to organize my knitting books and stash, as part of the fixing up of a room on the third floor. I spent the afternoon organizing my knitting books, but never made it to the stash before I just plain pooped out. Wow, do I have a lot of knitting books! And still, there are others that I would love to have ... but I digress. Anyway, in cataloging, you spend time determining not only the size and number of pages, or the format (book? periodical? realia?) of any given item, but what it is about, and how to classify it so that it will sit on the shelf with others of its ilk. I can do this at work without even really thinking about anything other than what I need to think about to create a record that a patron can use to find the book on the shelf. I could follow this path at home. But today, reorganizing my knitting books, I realized that I was more than willing to ignore everything else about a book - what was important was the size. I could not bear the thought of two books by the same author, or about the same technique, sitting next to each other on the shelf, if they were not the same size! (OK, I admit this is why I never made it to organizing my stash ...) I absolutely HAD to place things on the shelves of my small knitting bookcase, based on height. And not just general height - if one was a mere smidge taller than another, they got reversed. Really, I couldn't leave them alone until they were shelved on each shelf according to size. Well, they are organized. I'm tired. And the stash is still just hanging out, pushed into a corner, until I can get to it. The little knitting bookcase though, looks very nearly perfect. Hello everyone, my name is Bridget and I'm an organizational freak. 1. The Knitting Circle by Ann Hood. I was lucky enough to get an Advance Reader's Copy of this. It's the story of a woman whose young daughter died suddenly and unexpectedly, and her attempt to pick up and go on with her life. I will admit that I was skeptical, as I'm not a big fan of books that go like this: Woman experiences great tragedy. No one understands woman. 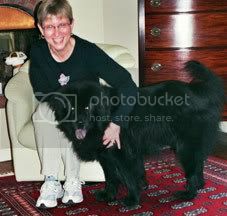 Woman seeks solace in sexual relationship with other man/woman/neighbor's dog. Woman still has hole in her life. Woman meets another woman/women and they bond in a sisterhood more intense than life itself. Other women show Woman how to cook/paint/knit/play the piano, and her life is changed. Woman finds life affirmation from other woman/women, while realizing that she was a wonderful person in the first place. The Knitting Circle then, was a nice surprise. Because though the central character does experience great tragedy, the book addresses her experiences in a pretty believable way, compared to what I was expecting. The feelings and sense of despair, and later those of realizing and acccepting that life goes on, are very well written, and make it seem more like a story about something that actually happened to a real person. The main character learns to knit, mainly to get her mother off her back. She finds that she likes knitting scarves, and through the other women at the knitting circle where she takes knitting lessons, she learns not only new stitches, but what things brought other people there. The characters are to some degree predictable, but Ann Hood draws them in a way that makes you think they are - or are based on - real flesh and blood persons. I found this book to be a good read, and I think it expressed the feelings of sadness, loneliness, and just plain ick that you experience when you lose someone that you love, in a true fashion. I think the non-fiction The Year of Magical Thinking by Joan Didion, published last year, was about as close to describing grief in words as you can get. But in my opinion, there are parts of The Knitting Circle that do this nearly as well in a fictional framework. 2. A Christmas Carol, by Charles Dickens. The December book for Knit the Classics, and a story that for me at least, is just as good every time I read it. The tale of Ebenezer Scrooge's transformation from a miserable, miserly, inconsiderate grump, to a generous, kindly soul never gets old. I love that it serves as a reminder to not just people who are well to do, but to all of us, that there are people in the world who would give anything to be in our shoes on our worst day. I am happy at the end to learn that Scrooge became someone who kept Christmas in his heart all year round, and I wish that more people could be like him (including myself). This of course has been made into numerous movies and adaptations, and some of them are particularly well done. Others ... not so much. The writing keeps up a good pace, and the involvement of the main character, at least, is within the [remote] realm of possibility. I would recommend it when you are in the mood for a mystery, especially one that takes place in the present day (more or less). Once again, I have to hope that Hollywood or Lifetime Television for Women ("Mother May I Sleep with an Innocent Person Wrongly Sent to Prison?") will leave this one alone. Alas, today is the last day of Christmastime. We had a great time, and though I didn't get any knitting-related things from Santa or from Tim (some years you do, some years you don't), I did get some great stuff from friends, which is always a welcome experience. My friend April looked at my Amazon wishlist, and bought me a copy of Arctic Lace, as well as Amy Sedaris' book on entertaining (I love Amy Sedaris!). They were a really nice surprise. I had really loved the copy of Arctic Lace that a co-worker had shown me, and I have been having a great time looking through my very own copy. Thanks, April! 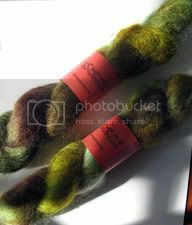 A few years back, I was part of a holiday gift exchange with someone else on a lace knitters listserv. As it turns out, the person I was matched up with was Sue, who is an incredible lace knitter, and a cyber friend extraordinaire. We check in with each other at least once a week, and have continued exchanging Christmas gifts every year. It turns out that we have a lot in common, and who knows, some day we may meet in person! Sue and her husband Mike have traveled the past two summers to Lithuania, Latvia, and the Czech Republic, as part of a teaching program that Mike participates in. This past summer, they set up a blog to detail their travels and adventures, and I loved checking it and vicariously traveling with them. In any event, thank you Sue, for another wonderful package! We will not discuss how long it took me to knit these. Ahem. Now, these lovelies are Lorna's Laces, in the Mixed Berries colorway, wound into center-pull balls. The smaller one is Shephard Sock, and the other is Shephard Worsted weight yarn. The pattern, Wisconsin Winter Socks, calls for one strand of each per sock. The sample sock in the store was a different colorway, but it was so pretty, and felt so soft and cozy, I thought it would be a great pair of socks for around the house this winter. Of course, if the winter continues like this, I'll just wait until next year ... maybe it will drop down to, oh I don't know, 30 degrees! The Wednesday night after Thanksgiving, I headed up to the nearby Barnes & Noble with Tim, because Patrick McDonnell, the creator of Mutts, was going to be signing his newest book, Just Like Heaven: I am a huge fan of Mutts, and was really excited to get to see Mr. McDonnell in person, and get a signed book. A few months prior, he had appeared at a B&N in one of the nearby 'burbs, and though I didn't get to go to that event, one of Tim's co-workers did go, and she brought back a couple of different books signed by him. I was thrilled to pieces with those, so you can imagine my anticipation at "meeting" him myself! He was there to kick off the Toys for Tots program, since the poster for this year showed the Mutts characters, and because he has been involved with the program, quite successfully, for a number of years now. Then he took questions from the audience. While he was answering questions, he would draw different characters from the strip, and talk about his inspiration for them. He was really interesting, and extremely personable, answering all and any questions asked of him. He told some funny stories, two which I thought I would share. As readers of the strip know, Mooch, the cat, always says "Yesh," and originally that is the only thing he was going to say that way. But as Mooch developed, it just seemed like he would pronounce his "s" like "sh," so that continued. Mr. McDonnell received an irate letter from a woman, saying that it was an absolute disgrace that Mooch spoke in such a sloppy manner. 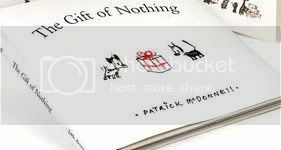 Apparently, the letter went on for a bit, complaining, and only at the end, did he find out why the woman writing it was so incensed: because she was convinced that her cat would never speak that way! That in and of itself was amusing, but Mr. McDonnell said he sent a response to her, and all it said was: "Shorry!" I knew I would find more reasons to like him! He talked more about his growing up in New Jersey, his art school experiences, and how he got started with the strip. It was so cool, because basically he is just a nice, normal type of guy, who is fortunate to be talented. He also talked about his work with the Humane Society of the United States, and other animal-related organizations. The strips he does twice a year called "Shelter Stories" apparently not only get a huge response from readers, but cause a spike in the adoption rates at shelters nationwide, which I just really loved hearing. After the questions were finished, he signed copies of his books, as well as Mutts bookmarks. He spoke to every person in line for a few minutes, as he was signing, and was very attentive and really nice, even after what was probably a long day for him. Here it is, the first day of 2007. New Year's Eve was a lot of fun, and given the odd assortment of food and drinks consumed late last night, I feel fine today ... not that I'm complaining, I'm just a little bit surprised. Melanie tagged me for this the other day, and I figured, what better way to start the new year, than to share six weird things about myself ... (what? only six?). I've tried to choose six that are weird enough to perhaps be interesting and amusing, but not weird enough to be scary. 1. Like some others have mentioned in their lists, I really do not like to talk on the phone. I love to write letters, and I enjoy e-mails (letters are better though), but if possible, I will try to get out of talking on the phone. For the most part, this is not a problem, as most of my phone calls are to/from either of my sisters, and short and sweet, or just to confirm a dr appt or something. But there are a few people who obviously love to talk on the phone, and when I pick up and it's them, I always wish I had just let voicemail get it. 1a. I'm calling this 1a, because it's kind of a result of plain old #1. I do not have a cell phone. I do not wish to have a cell phone, and hate even more talking to others using a cell phone. It's like they are calling from a shower stall or something. 2. When I go walking anywhere after Christmastime, and see discarded Christmas trees, I absolutely must say to them, "God Bless You, Christmas tree, thanks for a good holiday." No, I don't always say it out loud. 3. When I see a sign, billboard, etc. when traveling, or if I'm just taking a walk to enjoy myself, I take the words on the sign and first read them backwards, then alphabetize them, then see how many other words I can create from them. 6. I have a B.A. and an M.S.L.S., but I never graduated from high school. Nope, I don't have a GED either. And I was not part of an early admission program. Unfortunately about six weeks into my senior year, I got pneumonia. When I had fully recovered, the prinicipal of my high school said I would have to just repeat senior year, I'd missed too much (this was even though my mother had made arrangements for one of her friends, who taught at my high school, to tutor me so I could catch up). I had already been accepted into the three colleges where I had a applied, so I contacted them, and all of them said my grades were good enough that they would not require a high school diploma. In your face, Dr. Viglietta!